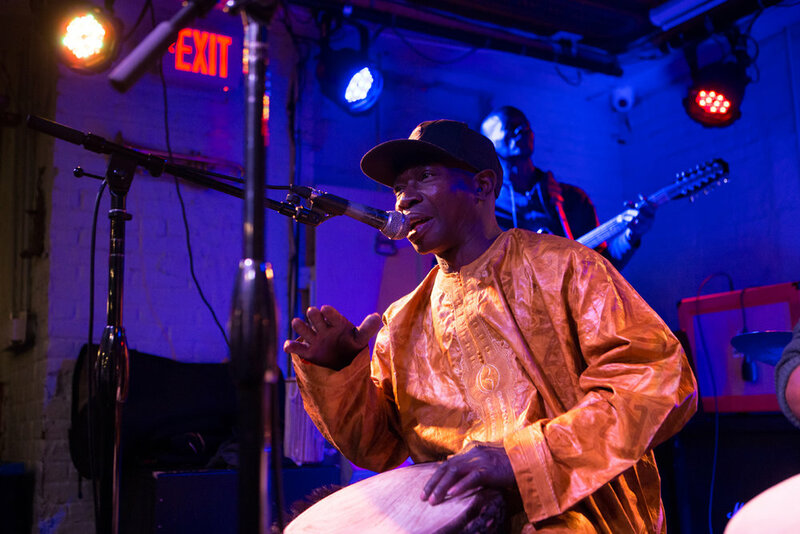 Dembaya recent performance at Silvana, in Harlem was a night of music that marked the US debut of two Malian artists Cheikne Bengue Sissoko and partner Yah Kouyate. What made this night so compelling was the interaction of Yah and her brother Makane Kouyate, Dembaya’s leader, singing together for the first time in 20 years. We first heard the two musicians perform at the MASA festival in Abidjan in March with Cheickne’s Somane 5 Tamens ensemble. This night was not a planned gig as the musicians were in New York for the first time to visit family, and sadly may have been a fleeting moment that will not be repeated due to immigration issues. Dembaya locked in immediately, borne from the years of working together. The hard hitting African jazz collective, on this night included Makane and Mamadou Konate on djembe, John Austria on keyboards, Marco Chelo sax, Charles Caldarola drums. Cheickne sat in with a newly purchased guitar. The set began with a jam with Makane calling the rhythm and directing musicians with a terse interaction between the drummers, with Mr.Chelo soloing and Mr. Austria adding a bassline with one hand and improvising in spaces where traditional instruments would have entered with the other hand. Mr. Chelo explained the musical relationship between the jazz musicians and Malians extends over 10 years. 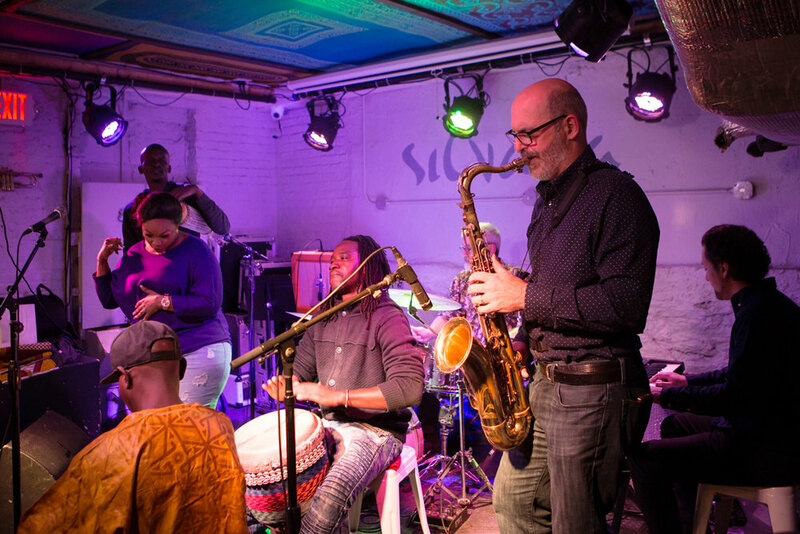 He and the members of the New York Jazz Workshop have become familiar with the complexities of Malian music dating from the St Nicks Pub African saturday night jams and later at the downtown club Boom on Wednesdays. Yacuba Diabate, Balla Kouyate, Jose Rosario, and Thierno Camara are also Dembaya members. 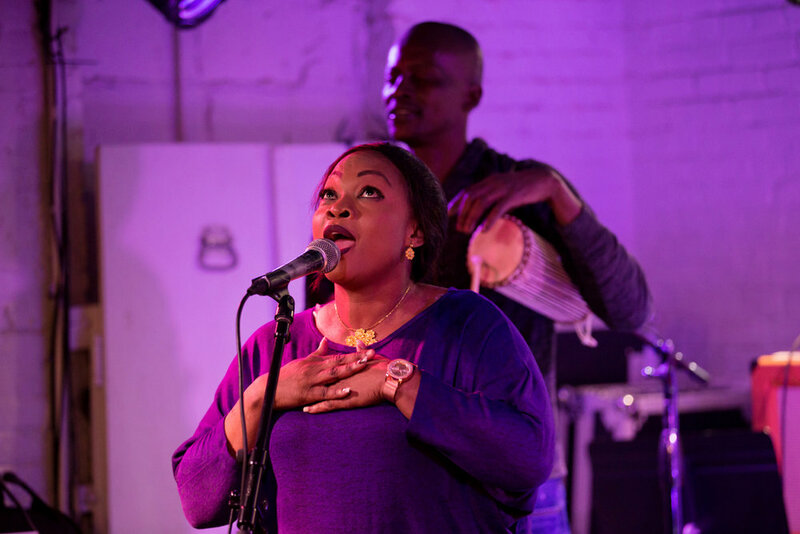 20 minutes or so into their set, Makane gave a nod towards Yah in the audience, and when she took the stage the set pivoted into traditional Malian music. Yah and Makane embraced while singing the songs of her family’s repertoire. They sang in Bambara but the emotion of the moment needed no translation, it was a riveting. Yah said singing these songs with her brother after so long gave her goose bumps. They come from a highly respected family of griots, but hadnt seen each other in 20 years with Makane living here without the opportunity to return home . As the evening unfolded Cheikne, who had switched to a talking drum provided for him, stepped from the background for two dazzling solos. The sound of the drum soon had dancers into the aisle in front of the stage. He also comes from a long line of griot musicians from the village of Madina Sacko in the Koulikoro region, spanning 7 generations, so he has been plaing the drum as long as he can remember. However, when asked about his griot heritage Cheickne wanted to make clear that the music he plays in the group he leads is as an artist. In fact he raised eyebrows when he combined 5 tamen into a drum kit of sorts. Even before the formation of his own band Somane 5 Tamens, he collaborted in a diverse group of artists in "Acte Sept" and “Théâtre Dans la Rue” and more recently with the group Funteni Baby and Sekou Bah and Bandia Jazz and will be at the 2019 Segou Art festival. (L-R) Cheickne Bengue Sissoko, Yah Kouyate, Charles Caldarola drums, Mamadou Konate djembe, Makane Kouyate djembe, and Marco Chelo sax. His Tamani d'Or Festival in Bamako is in its 5th year, started an international career in 2016, participating to the Eurockéennes de Belfort (France) and Roskilde Festival(Denmark). 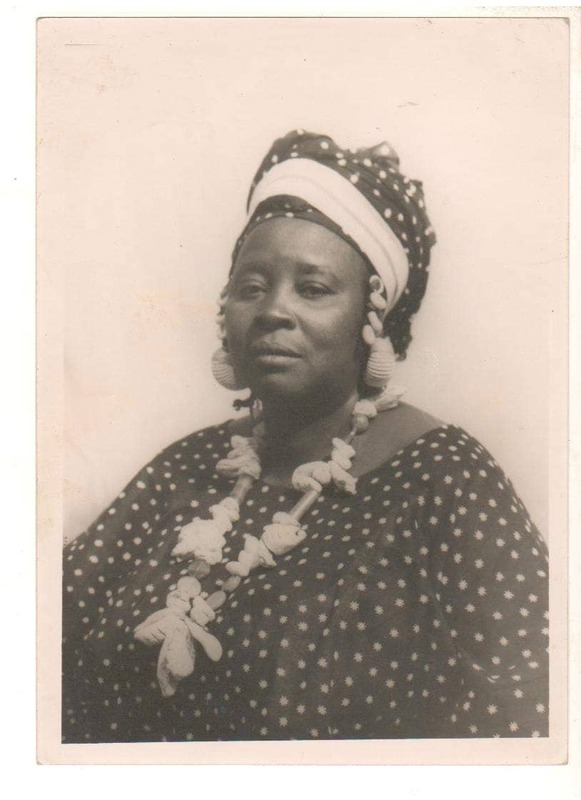 Walden Damba Sissoko, a griot and grandmother of Cheickne Bengue Sissoko. He recalled his first memory of working as a musician as traveling with his grandmother and father to Segou to play at a wedding at age 5. Photo courtesy of the artist. Speaking about his roots Cheickne remembers his first gig accompanying his grandmother Walden Damba Sissoko and father Baba Sissoko at a wedding at the age of 5. His father Baba Sissoko was instrumental in bringing the tamen into instrumental ensembles and orchestras. Through his father he realized that the tamen can be played with other instruments including n’goni, kora and balafon. Cheickne has accompanied some of the great griot singers Ami Koita, Kandia Kouyaté, Tata Bambo and his grandmother. Makane Kouyate’s future is currently in limbo, he is facing a deportation hearing, at the moment postponed due to the government shutdown. We wish him luck and hope he is here and able to perform when Yah and Cheickne return. Marco Chelo, tenor sax, with John Austria keyboards, left. Fatoumata Diakite captured Yah Kouyate singing in an intimate appearance during the visit,(video below) it was also broadcast to France and can be found on her you tube channel, “O’ Café de Faty”, Ms Diakite also holds a weekly facebook live broadcast (10am saturday in New York(tous les Samedi a 10h New York et 15h TU) featuring music and discussion of social issues, joined by viewers worldwide. She was thrilled to hear Yah sing live for the first time and found her every bit as good as she expected.